The American Robin is a bird we commonly look for in the spring in New Hanover and surrounding counties. This is a migratory species we commonly see on the ground in our backyards looking especially for worms. The American Robin is easy to identify. It has a gray back and head, white pattern around the eye, and a bright orangey chest. The beak is mostly orange with some black smears on the top, and they also have a white patch on their rump. The juviniles will have the same pattern overall, but will have brown spots within their orange chest as well as more white spots on their back. This bird is also easily identified by some of its sounds. If you listen the next time you are near some robins, listen for a bird making a 'whinney' sound- like a horse with a birds' vocal chords. American Robins eat mostly insects and fruit. A good way to attract them to your yard is to have bushes with berries on them, like chokecherries, sumac, or juniper. Since they also eat insects, it is suggested that you not use pesticides in your yard around these birds, because it may kill them. 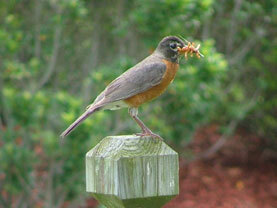 At Wild Bird & Garden, we stock mealworms- a favorite snack for American Robins. Some other foods we carry that will help attract robins are the insect suet cake, berry essence suet cake, and our woodpecker blend seed mix- which contains dried fruit as well as seeds. 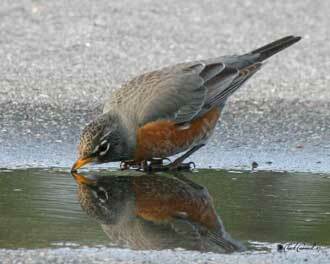 American Robin pauses for a drink. This species is one of the larger species of songbirds, being slightly larger than the Northern Cardinal. American Robin stuffs its beak with mealworms.